"We've developed an empirical model of global climate that we use to forecast future temperature out to the year 2100," said Timothy Canty, a research professor in atmospheric and oceanic science at UMD and a co-author of the book. "This is a model that ingests massive amounts of observational data." 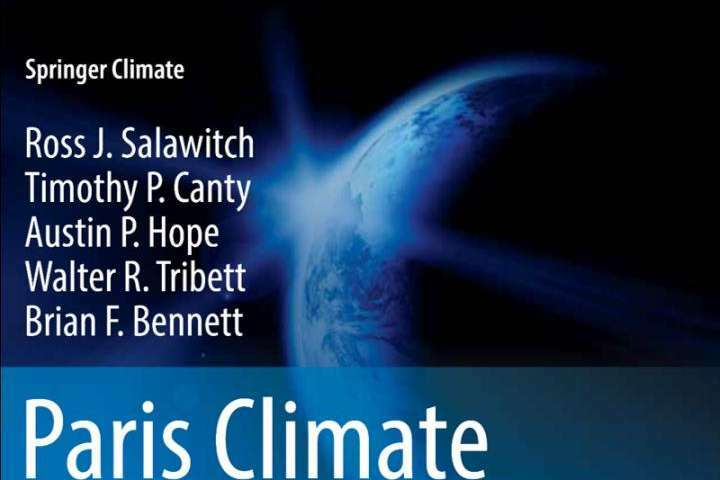 "The most important result from our modeling efforts is that the RCP 4.5 scenario is the two degree global warming pathway," said Austin Hope, a graduate student in atmospheric and oceanic science at UMD and a co-author of the book. "If the world keeps emissions to RCP 4.5, then we will likely stay beneath 1.5 degrees of global warming and almost certainly beneath two degrees of global warming,"
"Our research shows that if the Paris Climate Agreement is met, it will put us on the RCP 4.5 pathway, but this can only happen if two important things occur," said Walter Tribett, a research scientist in atmospheric and oceanic science at UMD and a co-author of the book. "One, all conditional and unconditional INDCs must be met. Two, the mitigation of greenhouse gases needed to meet the Paris goal must be propagated out to 2060." "To achieve RCP 4.5, half of the world's global energy must come from renewable sources by year 2060," said Brian Bennett, a research scientist in atmospheric and oceanic science at UMD and a co-author of the book. "Europe is lit up at night where its large population centers exist. The United States is equally lit up at night and we are seeing China emerge in the night light data," said Ross Salawitch, a professor of chemistry as well as atmospheric and oceanic science at UMD and a co-author of the book. "But largely absent in the night light data is India, and totally absent is Africa." The book's authors suggest that the developing world will have a great need for renewable energy solutions. But the developed world has a large role to play as well. "This will require large-scale transfer of technology and capital from the developed to the developing world," noted Salawitch, who also has an appointment with UMD's Earth System Science Interdisciplinary Center (ESSIC). "And at the same time this is happening, the developed world must reduce its own dependence on dependence on fossil fuels—not a little bit, but massively—by 2060."